Don't worry... I haven't slipped into a depression over the reduced bird activity. In fact, the bird activity is ramping back up nicely with shorebirds passing through and passerines starting to shuffle around. 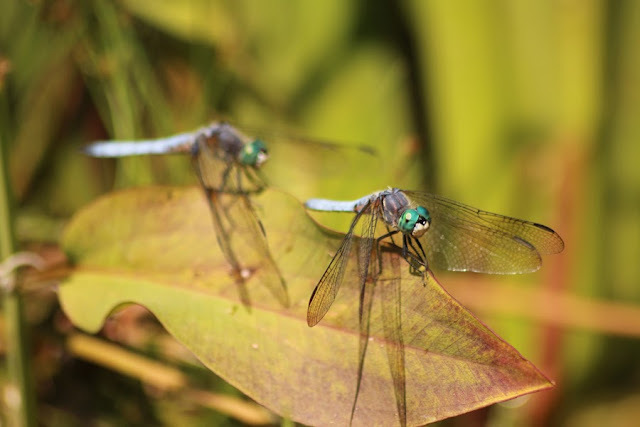 Instead, I am referring to a pair of nice blue dragonflies that can be found flying together through June and July: Blue Dashers (Pachydiplax longipennis) and Western Pondhawks (Erythemis collocata). In British Columbia, the distribution of these two species is quite restricted and they are both provincially blue-listed. Their ranges are virtually identical, occurring primarily west of the Coast Mountains to approximately 50°0'N, but also sneaking north of the border into the southern interior to the north end of Osoyoos Lake. To the untrained eye, the males of these two species probably look very similar. With a few pointers, I am confident you will be able to sort them out. The females, on the other hand, are very different and you should never get them mixed up. I will focus on the males here because they are both powdery blue denizens of ponds and marshes on southern Vancouver Island. Luckily for me, I just have to step outside my door and both are flying around the small manmade pond here. On July 13, I lazed a good portion of the day away as I had just returned from the buggiest, muggiest work trip I have been on in ages. I kept telling myself to get out and enjoy the day but I was just so content relaxing. Finally, I picked myself up and got all my gear together. I walked out the door and started to load up the vehicle to take off and then got distracted by all the dragonflies around the pond. I was thrilled to see a Blue Dasher right next to a Western Pondhawk, which was really the motivation behind this entry. Not only was I able to study the visual characteristics of these two species, I was able to note differences in their behaviour. There should be a few features that stand out to differentiate these two if you did a quick compare and contrast. They are both mid-sized dragonflies that have powder blue pruinosity, but that just gives them a superficial similarity that is enough to throw a skilled observer off if they only get a quick fly-by view. Let's break down the walls of identification systematically. Starting with the head, I already mentioned the slight difference in eye colour: radiant turquoise for male Blue Dashers and a somewhat swirling deep blue for male Western Pondhawks. 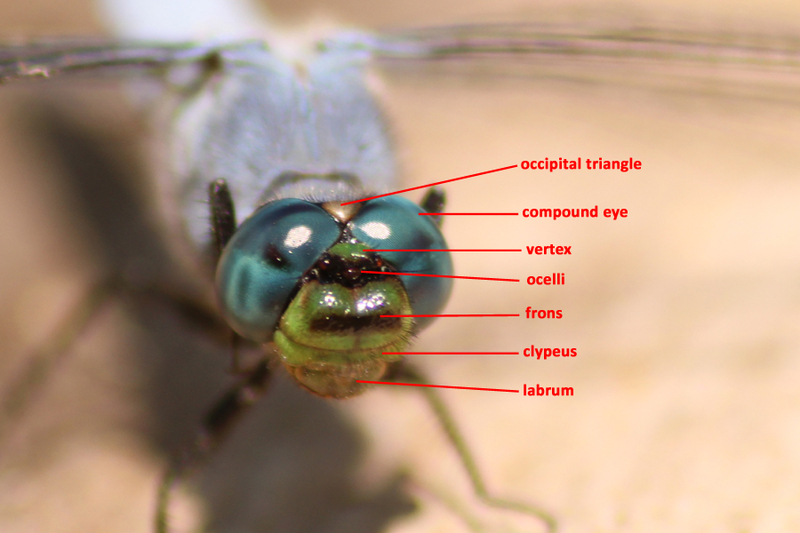 Before I delve any further, I will take this opportunity to give a quick anatomy lesson for the head of a dragonfly. Every group of organisms seemingly has new terminology for different parts and it would be cruel to throw out a few of these words without context! As you can see, the vertex of the male Western Pondhawk is green, as is the frons, clypeus, and labrum. On a Blue Dasher, the vertex is black and the frons, clypeus, and labrum are all white. I think of the frons, clypeus, and labrum together as the "face" and I find assessing the colour of the face tp be the easiest way to distinguish these two. 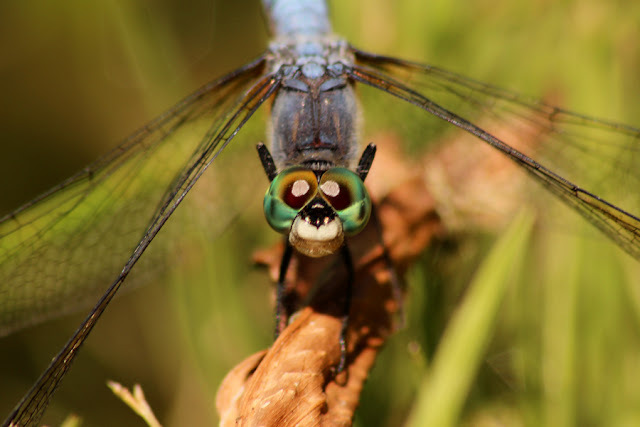 Below is a head on view of a Blue Dasher for comparison. See... it's not so daunting if you just stare them in the face! 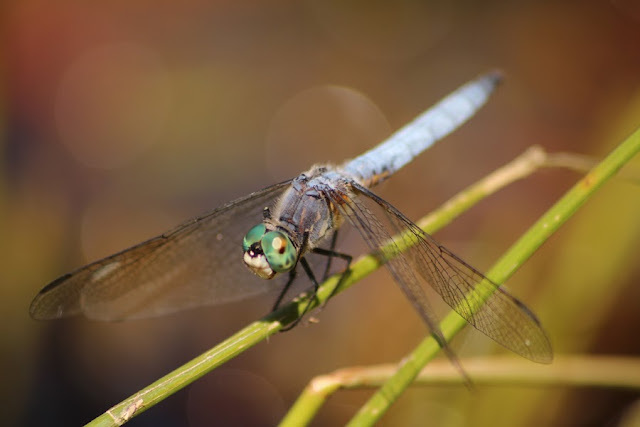 Dragonflies don't always offer up the greatest looks, so I have a few other features to look for if you happen to find one that is facing away. 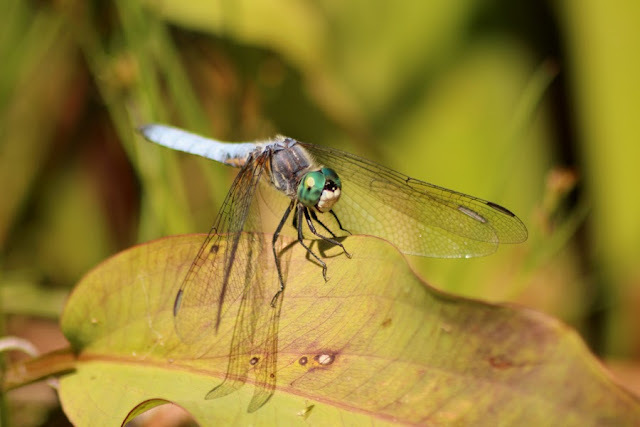 If you can get a look at the wings, Blue Dashers have amber staining at the base of the wings, while wings of Western Pondhawks lack staining. Next, the thorax of a Blue Dashers is patterned yellow-and-black before the pruinescent blush achieved with maturity obscures it. This striped pattern can usually be discerned through the granular blue coating. 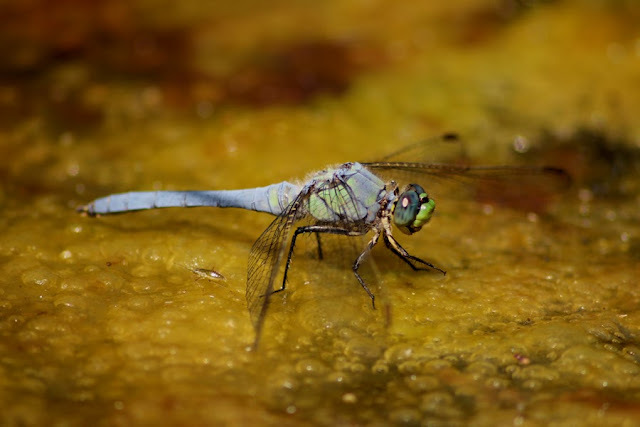 Western Pondhawks, in contrast, are lime green before the pruinescent pigmentation effectively covers that colouration. Look back to the first photo of a Western Pondhawk to see an example of a Western Pondhawk that has not fully coated its thorax and has some green peeking through. 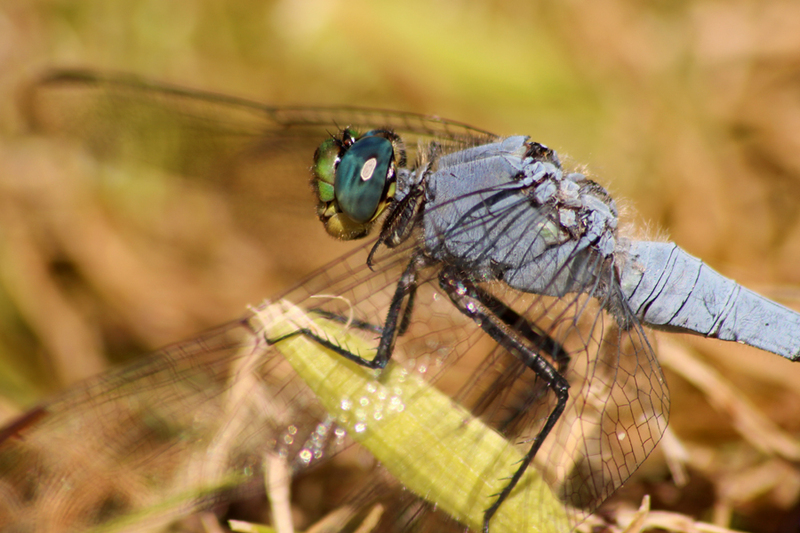 Finally, the last two segments of a male Blue Dasher's abdomen are usually darker than the rest of the abdomen, whereas a Western Pondhawk has a rather uniform powder blue abdomen. Just like the thorax pattern, this feature seemingly fades as individuals mature and more pruinosity coats the abdomen. I have a couple shots that hopefully illustrate the three features mentioned. Now I'll touch on a couple features that are harder to use. First, the size of these two differs ever-so-slightly. 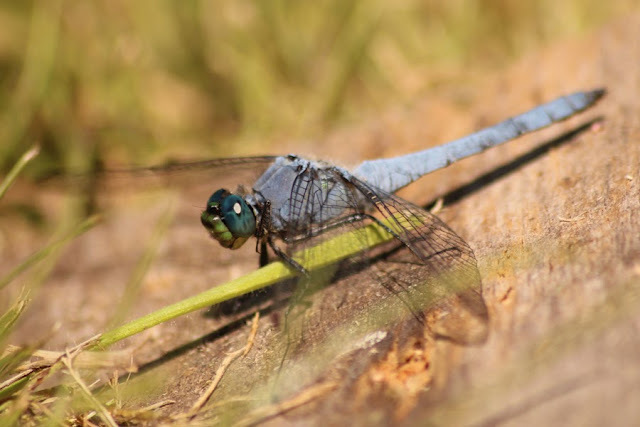 You need a bit of experience with them to get a sense that the average Western Pondhawk is several millimetres bigger than the average Blue Dasher. 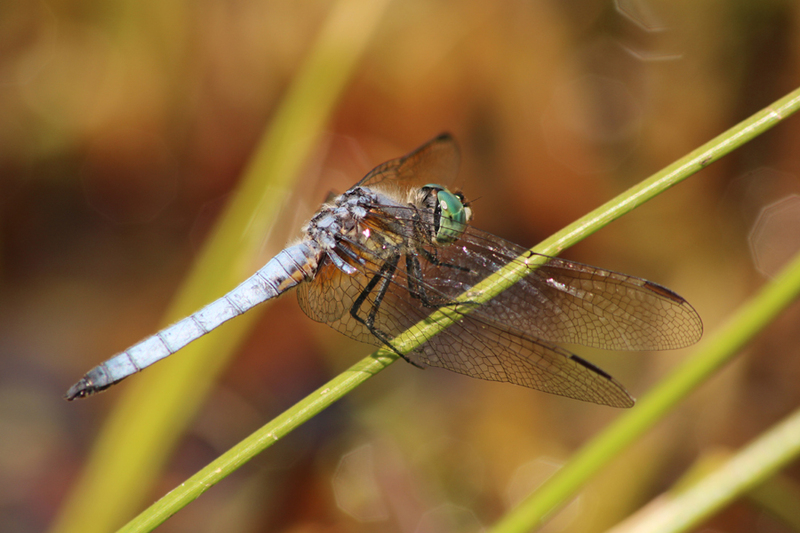 According to Cannings' "Introducing the Dragonflies of British Columbia and the Yukon", male Western Pondhawks are 42 mm and male Blue Dashers are 38 mm. I imagine you're thinking it's crazy to think you can tell notice a few millimetres difference, but it is surprisingly easy. It is, after all, 10% of the dragonfly's length! The last observation I made that seems to help distinguish these two is their choice of perches. Blue Dashers seem to prefer picking elevated perches at the pond's edge. The perches are typically vegetation, such as cattails, rushes, or leafy emergent plants. Western Pondhawks almost land on the ground or on flat surfaces. For instance, I pretty much exclusively saw Western Pondhawks resting on large rocks, wooden boards, algae mats, and trimmed grass. Two Blue Dashers agree they prefer leafy emergent aquatic plants! Now that we've broken down the walls, hurry up and get out there to test your skills before their flight season is over! I would recommend heading to Swan Lake, the Beaver Lake retriever ponds, Viaduct Flats, or Rithet's Bog if you're looking for suggestions. I have also had success with Western Pondhawks around small reservoirs in agricultural areas. Feel free to write back with tales of success and also let me know if there is another local species comparison you would like me to write about.